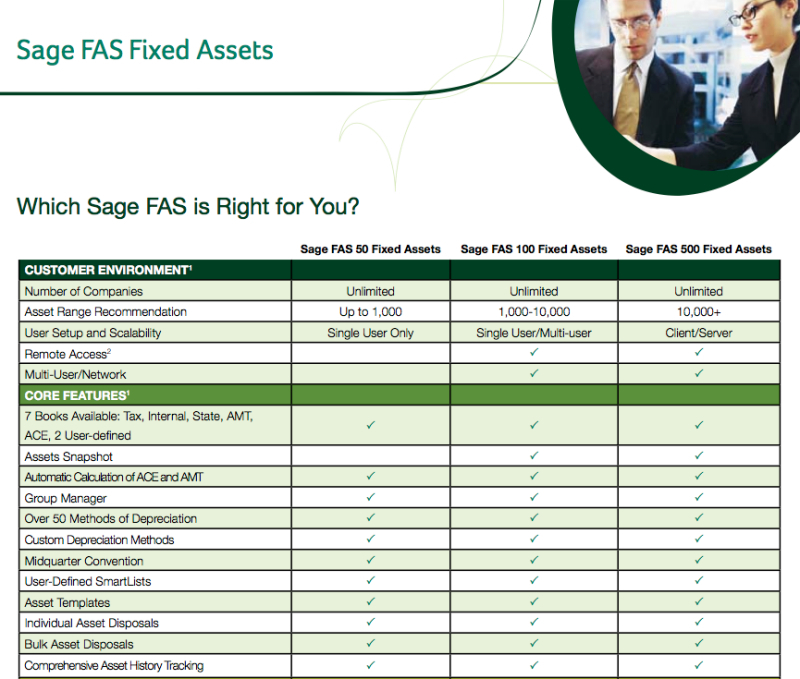 Which Sage FAS Fixed Assets Is Right For You? You are here: Home / Sage 100 ERP / Which Sage FAS Fixed Assets Is Right For You? Sage offers several varieties of fixed asset accounting software. Their three main choices are: Sage FAS 50 Fixed Assets, Sage FAS 100 Fixed Assets, and Sage FAS 500 Fixed Assets. Do you know which variety is best for your company? Generally the first qualifier may be the numbers of assets you need to depreciate. Sage FAS 50 Fixed Assets supports up to 1,000 assets, Sage FAS 100 Fixed Assets supports up to 10,000 and Sage FAS 500 Fixed Assets is appropriate for 10,000+ fixed assets. Another important differentiator is that the Sage FAS 50 Fixed Assets will only work for singer user (non-network) environments – while Sage FAS 100 and 500 both work in Single Users/Multi-User or Client/Server (Sage FAS 500). For more details download Which Sage FAS is Right For You?